Appointed with the typical features that you'd expect on a Stratocaster, the American Performer does however boast some thoughtful modern features to bring it up to scratch. Sporting brand new Yosemite single-coil pickups and a punchy DoubleTap humbucker, this guitar also features a smooth satin-finished neck and the desirable 'Greasebucket' tone circuit. Fender's long-established tonewood combinations remain intact with the American Performer Strat HSS. Featuring an Alder body, this popular material ensures balanced lows, lively mids and a crisp top-end, serving as the perfect tonal foundation for the bright-sounding single-coils. The Alder body is paired with a Maple neck, accentuating the highs even more to allow your playing to really cut through in a mix. Adorned with a Rosewood fingerboard, this silky-smooth material adds some crucial lower mid-range warmth, while the bolt-on construction gives notes a definitive snap. 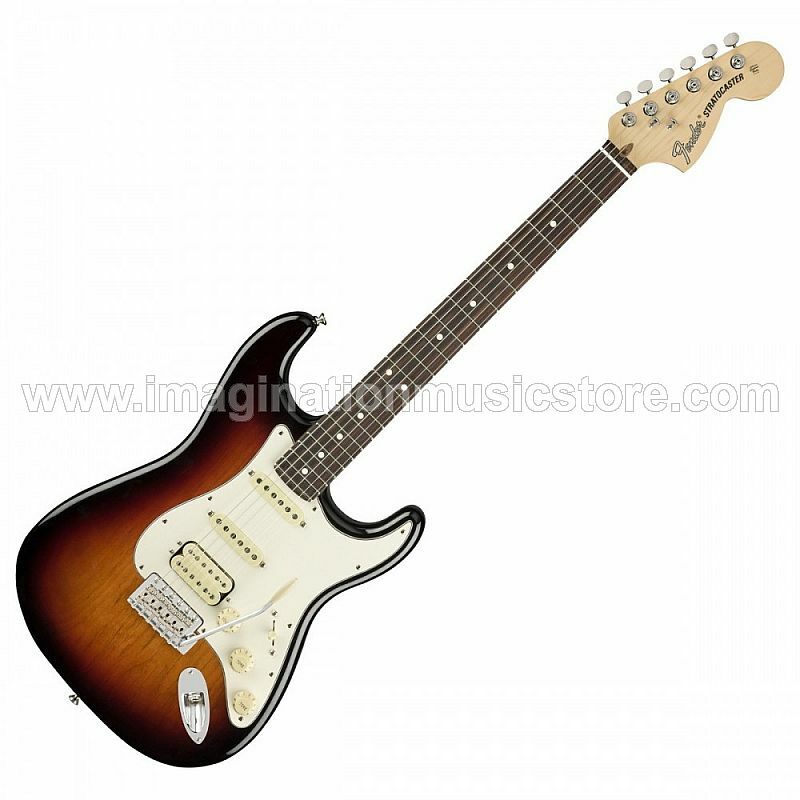 The most noteworthy aspect of the American Performer Stratocaster HSS is its set of pickups. Installed with a pair of Fender's new Yosemite single-coils, these pickups are designed to project rich and expressive tones. With flat-staggered pole pieces that increase their output, these pickups also have a shellac coating that controls feedback without choking their sound. The DoubleTap bridge humbucker, however, is a different affair. With a thick and powerful sound, this pickup can be tamed when you activate the tone control's push/pull function, letting you attain a single-coil voicing that doesn't suffer from any volume drop. Making this instrument suitable for a number of styles, these pickups unlock even more versatility from what is already considered as the most adaptable guitar design ever. It doesn't end there either, as the American Performer Strat also features the 'Greasebucket' tone circuit. Letting you roll off the top-end without adding any bass frequencies, you can use your tone controls in a more useful and musical manner - not turning your guitar tone to mush! At the other end of the instrument you'll find a set of Fender American Performer tuners. Offering a smooth feel for precise pitching, these tuning machines will keep the strings stable and secure.